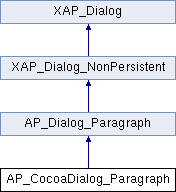 References AP_Dialog_Paragraph::_createPreviewFromGC(), XAP_App::getApp(), m_pGraphics, XAP_App::newGraphics(), and size. Referenced by _populateWindowData, and _syncControls. References AP_Dialog_Paragraph::_getCheckItemValue(), AP_Dialog_Paragraph::_getMenuItemValue(), AP_Dialog_Paragraph::_getSpinItemValue(), _getWidget, _tCheckStateToNS, AP_Dialog_Paragraph::id_CHECK_DOMDIRECTION, AP_Dialog_Paragraph::id_CHECK_KEEP_LINES, AP_Dialog_Paragraph::id_CHECK_KEEP_NEXT, AP_Dialog_Paragraph::id_CHECK_NO_HYPHENATE, AP_Dialog_Paragraph::id_CHECK_PAGE_BREAK, AP_Dialog_Paragraph::id_CHECK_SUPPRESS, AP_Dialog_Paragraph::id_CHECK_WIDOW_ORPHAN, AP_Dialog_Paragraph::id_MENU_ALIGNMENT, AP_Dialog_Paragraph::id_MENU_SPECIAL_INDENT, AP_Dialog_Paragraph::id_MENU_SPECIAL_SPACING, AP_Dialog_Paragraph::id_SPIN_AFTER_SPACING, AP_Dialog_Paragraph::id_SPIN_BEFORE_SPACING, AP_Dialog_Paragraph::id_SPIN_LEFT_INDENT, AP_Dialog_Paragraph::id_SPIN_RIGHT_INDENT, AP_Dialog_Paragraph::id_SPIN_SPECIAL_INDENT, and AP_Dialog_Paragraph::id_SPIN_SPECIAL_SPACING. References AP_Dialog_Paragraph::_getMenuItemValue(), AP_Dialog_Paragraph::_getSpinItemValue(), _getWidget, AP_Dialog_Paragraph::id_MENU_SPECIAL_INDENT, AP_Dialog_Paragraph::id_MENU_SPECIAL_SPACING, AP_Dialog_Paragraph::id_SPIN_AFTER_SPACING, AP_Dialog_Paragraph::id_SPIN_BEFORE_SPACING, AP_Dialog_Paragraph::id_SPIN_LEFT_INDENT, AP_Dialog_Paragraph::id_SPIN_RIGHT_INDENT, AP_Dialog_Paragraph::id_SPIN_SPECIAL_INDENT, AP_Dialog_Paragraph::id_SPIN_SPECIAL_SPACING, AP_Dialog_Paragraph::indent_FIRSTLINE, AP_Dialog_Paragraph::indent_NONE, AP_Dialog_Paragraph::spacing_DOUBLE, AP_Dialog_Paragraph::spacing_MULTIPLE, AP_Dialog_Paragraph::spacing_ONEANDHALF, AP_Dialog_Paragraph::spacing_SINGLE, and UT_ASSERT. Referenced by event_EditChanged, and runModal. References AP_Dialog_Paragraph::check_FALSE, AP_Dialog_Paragraph::check_INDETERMINATE, AP_Dialog_Paragraph::check_TRUE, UT_ASSERT, and UT_SHOULD_NOT_HAPPEN. References AP_Dialog_Paragraph::_setCheckItemValue(), UT_ASSERT, and UT_SHOULD_NOT_HAPPEN. References AP_Dialog_Paragraph::_setSpinItemValue(), _syncControls, gchar, and UT_ASSERT. References _createGC, _populateWindowData, _syncControls, event_PreviewAreaExposed, AP_Dialog_Paragraph::id_MENU_ALIGNMENT, m_dlg, and AP_Dialog_Paragraph::m_pFrame. Referenced by _getWidget, event_MenuChanged, and runModal. Referenced by _createGC, _deleteGC, and ~AP_CocoaDialog_Paragraph.